Makeover your bathroom with just a single touch! Start with these waterproof and decorative shower curtains. It's a quick and luxurious way to refresh and change the appearance of a bathroom, power room, restroom, guest suite or hotel bath without a big expense. Colors won't fade thanks to new digital printing methods. The fabric curtain is machine washable for easy home care. It's not too thin or too thick. Adds real value and depth to your decor. They're waterproof and dry fast after you shower. A perfect gift idea for your mom, dad, sister, brother, grandma, grandpa, wife, husband, son, daughter and all other. As manufacturers of digital printed home textiles, we follow current trends and bring you the latest home fashion. Either a gift to your family or friend, parents, grandparents, relative, boyfriend, girlfriend, the item should be interesting and authentic. Men, women, kids, teens, boys or girls will love this item. Note: Because of the different monitors in each computer and the shooting light difference, the pictures and actual products will be slightly different. Size: 72x72 inches / 180 x 180 cm. Includes 12 plastic curtain hooks. Material: 100% Polyester. Environmentally friendly, no dye substance harming health of your family. Waterproof and mold/mildew resistant, make water and mildew difficult to adhere to a certain extent. Comes with plastic ring hooks for the shower curtain and rustproof metal grommets. Machine washable and can be cleaned with a quick rinse. If you have any questions about this product by VaryHome, contact us by completing and submitting the form below. If you are looking for a specif part number, please include it with your message. 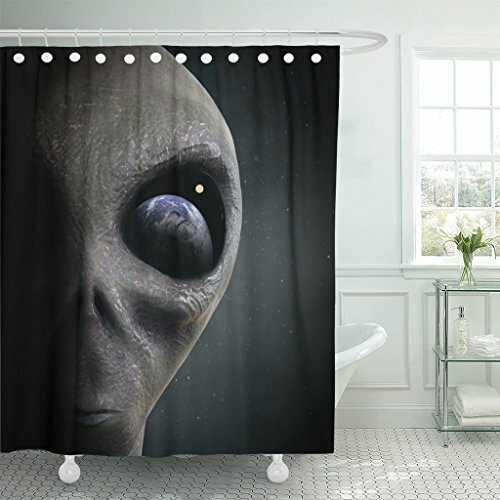 SCOCICI1588 Soft Bathroom Towel Set Warning Signs with Alien ces Heads Galactic Paranormal Activity Soft, Fade-resistant 13.8"x13.8"-11.8"x27.6"-27.6"x55.2"